A Federal explosives license is valid for a term of three years. Three months prior to the end of the three year period, the Federal Explosives Licensing Center (FELC) will automatically generate an explosives renewal application, an ATF Form 5400.14/5400.15 Part III, and send it to you in the mail. When completing the renewal application, note any changes that may have occurred to your existing operations to include; changes in storage locations, additional storage facilities and their type, changes or additions in Responsible Persons (RP's), additions of Employee/Possessors (EP's), etc. Then simply mail the application with the applicable renewal fee to the Atlanta P.O. box listed on the application. Your application will then be forwarded from Atlanta to the FELC in Martinsburg, WV to be processed. Note: For all Responsible Persons listed on your license who submitted fingerprint cards and photographs prior to this renewal, they do not need to resubmit new fingerprint cards and photos. However, all new Responsible Persons being added to your license must submit fingerprint cards and photographs with the renewal application. To assist you in preparing your renewal application for a Federal Explosives License/Permit (FEL), we have prepared a checklist for you to use. Please complete all forms included in your renewal application packet in accordance with the instructions on each form. Verify that item 13 (second page of ATF F 5400.13/5400.16) has been filled out by all Responsible Persons listed on the license or permit. Attach one FD-258 (fingerprint card) and one 2? x 2? photograph for each newly added Responsible Person identified in item 13 (ATF F 5400.13/5400.16). Fingerprints must be taken by a law enforcement official. Fingerprint cards and photographs do not need to be submitted by individuals who have previously submitted them. Complete ATF F 5400.28 ? Employee Possessor Questionnaire for any individual who meets the definition of an Employee Possessor (see definition #2 on back of form). Also verify that each form has been signed by the person on the form and all questions have been answered. Employees that have previously submitted a form may initial the questions and resign and date previously submitted form (if all other information has not changed). ATF will deactivate any Responsible Person and Employee Possessor not included in renewal package. 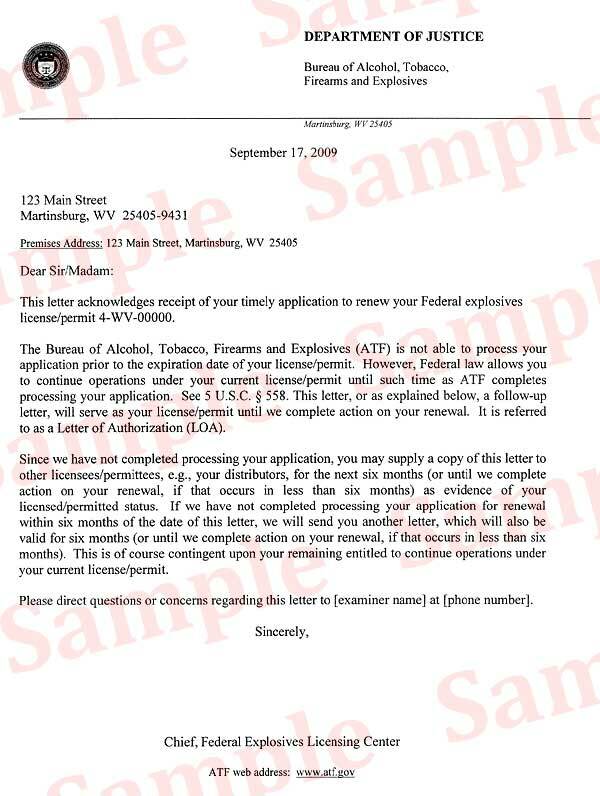 When you have sent your Federal Explosives License or Permit (FEL) Renewal Application, ATF Form 5400.14/5400.15 Part III, to ATF prior to the expiration of your federal explosives license and the application form has been postmarked before the expiration date, you may request a Letter of Authorization (LOA) from the Federal Explosives Licensing Center (FELC) to carry on your business operations while your renewal application is in a pending status. The LOA provides evidence to your distributors that you may continue your business operations under your current license until ATF has completed the processing of your renewal application, even if the time needed by ATF to process the application extends beyond the expiration date of the current license. The LOA will state that operations may continue under the existing license for a period of up to six months. If the FELC does not complete processing of the application within the six month period specified in the LOA, you may request the FELC extend the LOA. You may also provide copies of the LOA to your suppliers.